Desi Smith /Gloucester Daily Times. 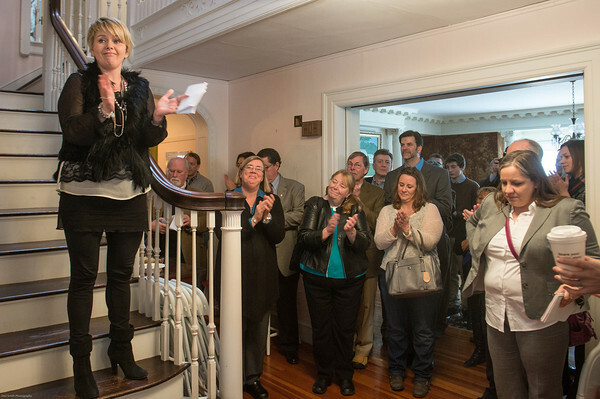 Icelandic Minister of Industry and Commerce Ragnheiour Elin Arnadottir (on stairs) along with others including Mayor Carolyn Kirk, city council members Melissa Cox and Paul McGeary applaud members of the Icelandic commity (out of frame) who helped devolpe Innovation House, Saturday afternoon at a reception hosted by US Embassy in Iceland and Innovation House on Norman Ave in Magnolia. March 15,2014.